Drone footage of the ongoing construction of Apple ‘Spaceship’ Campus 2 have been quite regular, and the latest one comes from aerial documentarian Matthew Roberts. His latest video gives us a full-blown aerial tour of the majestic campus giving us a sneak peek at the auditorium, R&D facility, the parking space, and even the new fitness centre for employees. The video also hints that the construction might be nearing its end. 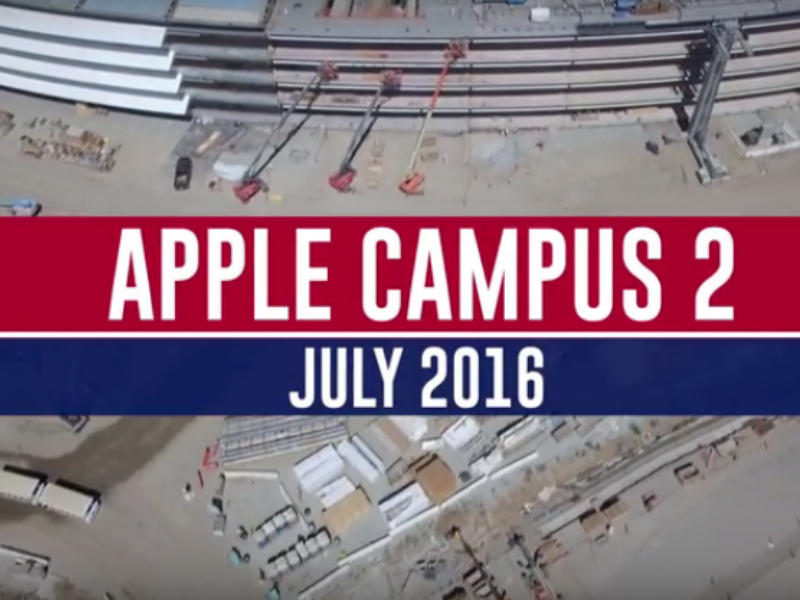 Roberts has been releasing monthly video updates of the Apple Campus 2 in Cupertino since March this year. Apple got a go ahead to build the spaceship-like campus in November 2013. The latest video shows us the progress the construction has made, and it looks like the work is nearing completion. The building’s circular spaceship-like structure is seen taking shape, with glass panels now being installed. The video claims that the company’s Research and Development wing exterior is nearing completion, with glass panels’ installation already underway. The fitness centre dedicated to employees spans 10,000 sq. ft. on the campus. The car parking area can house as many as 11,000 vehicles at one time. Roberts claims that the parking structure solar panels are about 95 percent complete. These solar panels will be capable of producing 16-megawatts of power, and additional 4 megawatts of power will be supplied by fuel cells. The combined electricity could power as many as 3000 homes, sufficient to power the campus even during events like launches and WWDC, Apple’s annual developers’ conference. The campus will need a total of 3,000 glass panels to build the spaceship campus. The video claims that about 1.2 million square feet of glass will be used at the Apple Campus 2. The in-house auditorium and visitor centre is also seen taking shape. It spans across 120,000 sq. ft. and provides seating for 1,000 people. It will include a large lobby area with kitchen facilities. This is where Apple is expected host all of its events in the future. The parallel project of additional buildings along North Tantau Avenue has also been documented. In some areas, the foundation work has begun, while other buildings are being constructed rapidly. Roberts also captures the bizarre mountain of dirt collected at the construction site, which he claims will be used for landscaping later. Of course there is plenty of work that is still left, but comparing it to last year’s video, the campus construction has come a long way in one year. The campus is expected to be ready by sometime next year.